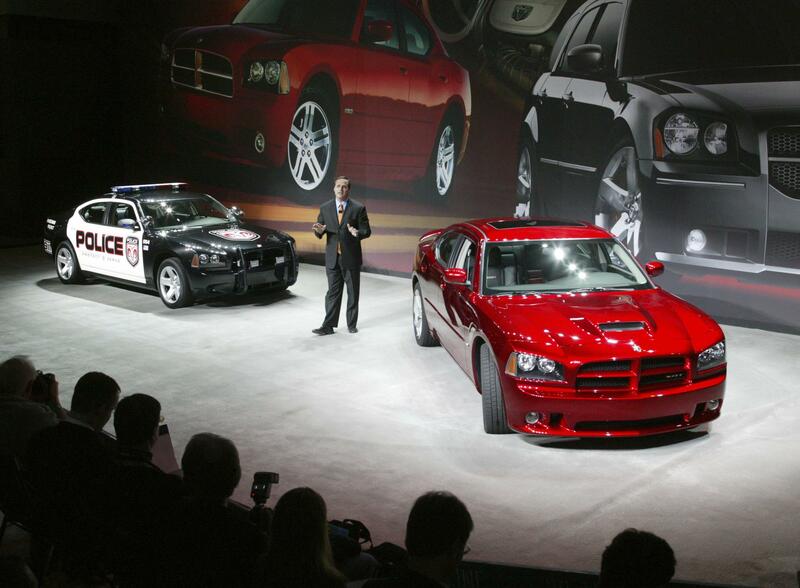 New York, Mar 24, 2005 - When Dodge unveiled the all-new 2006 Dodge Charger into its lineup, performance-car aficionados had a lot to celebrate. The party gets kicked up a notch with the introduction of the all-new 2006 Dodge Charger SRT8. With its infusion of Street and Racing Technology (SRT) DNA, the all-new 2006 Dodge Charger SRT8 provides exactly what performance enthusiasts want in their American muscle sedan: more power, world-class ride and handling, benchmark braking, functional and aggressive-looking exterior enhancements and a race-inspired interior. "The all-new Dodge Charger embodies all of the key attributes of the Dodge brand � bold, powerful, street-smart and full of life," said Darryl Jackson, Vice President, Dodge Marketing, Chrysler Group. 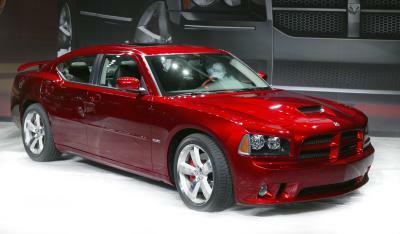 "The all-new 2006 Dodge Charger SRT8 builds on the Dodge formula. It starts with a 425-horsepower 6.1-liter HEMI engine and continues with a powerful dose of renowned Street and Racing Technology performance for a tremendous performance-per-dollar value story." During the heyday of the original Dodge Charger, performance was measured mainly in straight-line numbers. 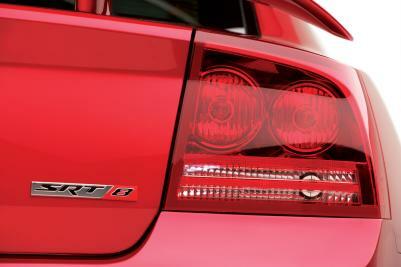 Today, SRT adds a complete approach with the all-new 2006 Dodge Charger SRT8. "The SRT approach to performance is multi-dimensional," said Dan Knott, Director, Street and Racing Technology, Chrysler Group. "For example, the 2006 Dodge Charger SRT8 incorporates Brembo brakes to stop as well as it accelerates. Its handling is world-class across a dynamic range. Its interior is designed specifically for the performance driver. And its performance exterior characteristics don�t just look great, they�re also functional." 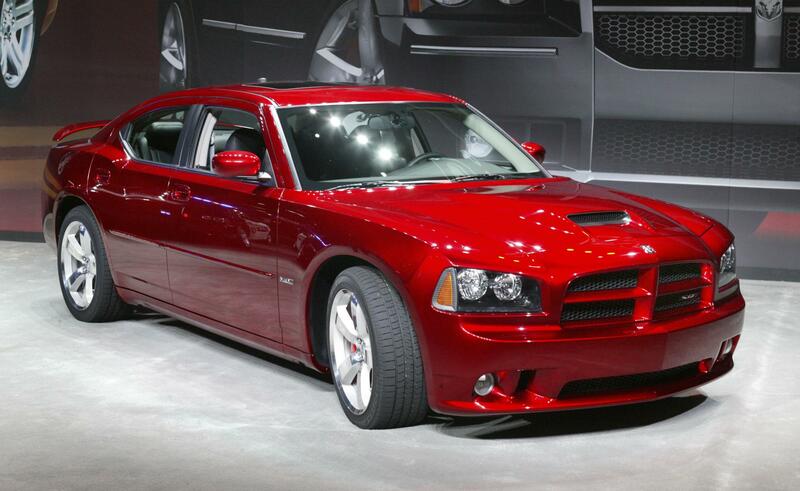 As an all-around performer, the all-new 2006 Dodge Charger SRT8 is capable of awe-inspiring numbers unheard-of in a muscle sedan: 0-60 mph in around 5 seconds, quarter-mile time in the 13-second range and braking distance from 60-0 mph in approximately 110 feet. The Dodge Charger SRT8 is also capable of accomplishing SRT�s signature performance test of 0-100-0 mph in the mid 16-second range. 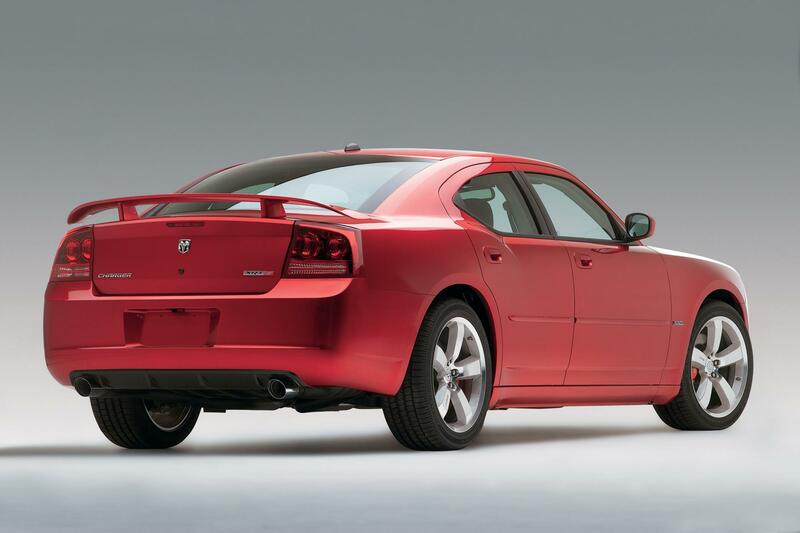 Chassis improvements on the 2006 Dodge Charger SRT8 include SRT-tuned dampers, specially tailored spring rates and suspension bushings, and large-diameter anti-sway bars. The ride height of the 2006 Dodge Charger SRT8 is one-half inch lower than the Dodge Charger. Handling is enhanced for performance with an Electronic Stability Program (ESP) specially tuned for the 2006 Dodge Charger SRT8. The all-new 2006 Dodge Charger SRT8 rides on unique SRT-developed five-spoke 20-inch forged aluminum wheels. Tires are high-performance Goodyear Supercar F1 three-season tires with asymmetrical tread (four-season tires are an available option) - 245/45/20 in the front, and 255/45/20 in the rear. Balanced performance demands the ability to slow and stop a vehicle in proportion to the ability to accelerate. The braking system of the all-new 2006 Dodge Charger SRT8 provides benchmark braking performance, befitting the Charger SRT8�s extreme performance character. 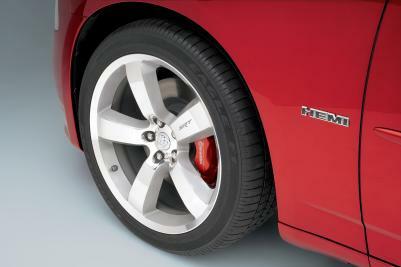 All four wheels feature Brembo performance brake calipers, with the red finish characteristic of all Dodge SRT vehicles. Each four-piston caliper grips a vented rotor; 360 x 32mm discs up front, with 350 x 26mm in the rear. 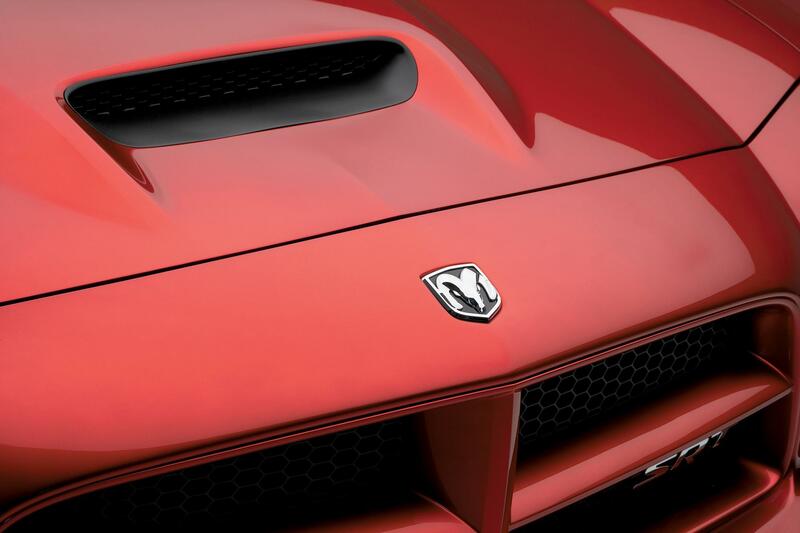 Functional performance is at the heart of the SRT credo. To that end, an all-new front fascia includes integrated ducts that help direct fresh air to cool the brakes. The front fascia also incorporates an air dam to reduce lift. The hood is equipped with a scoop to funnel cool air into the engine compartment. The rear fascia features integrated lower strakes to direct air flow and aggressive cutouts to accommodate dual 3.5-inch exhaust tips. 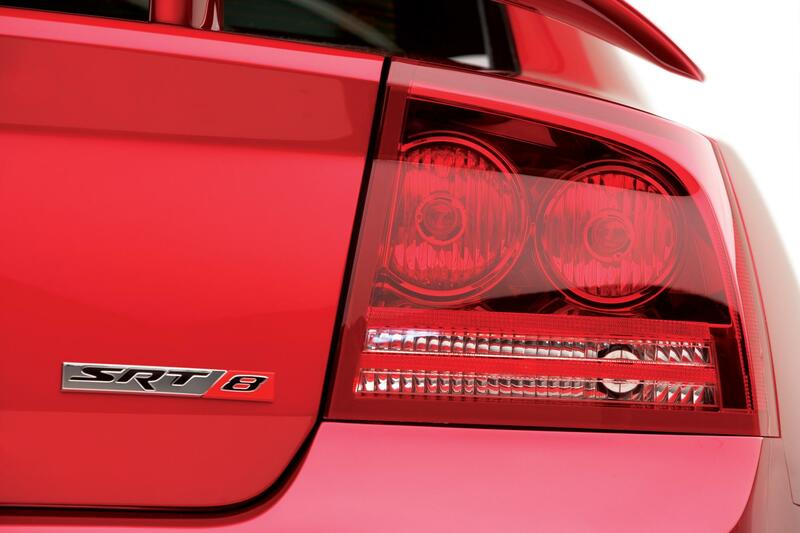 A dramatic decklid spoiler set on dual stanchions increases downforce for high-speed stability and traction. And because SRT vehicles look as good as they perform, a unique heritage-style SRT badge is set into the blacked-out grill. Body-colored exterior mirrors fold inward for convenience in tight quarters. Three exterior colors are available: Bright Silver, Brilliant Black and Inferno Red Crystal Pearlcoat. 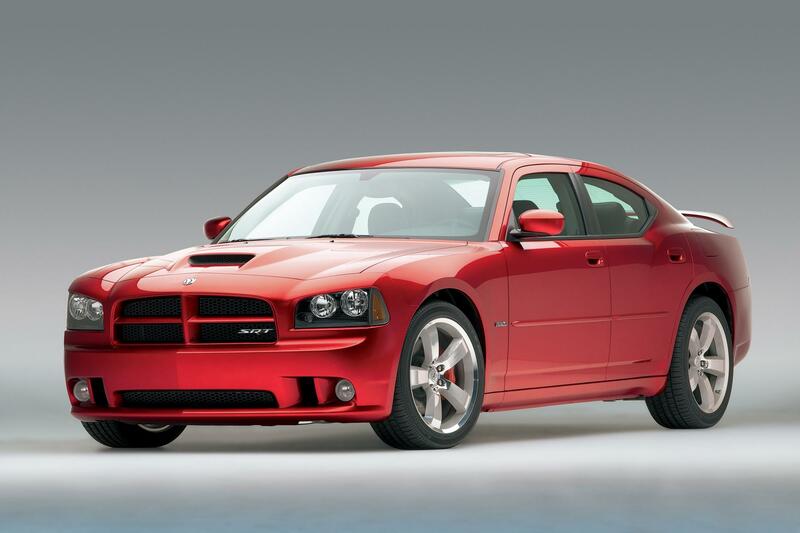 Race-inspired interior appointments in the 2006 Dodge Charger SRT8 start with power-adjustable, deeply sculpted and highly bolstered sport seats in the front fitted with performance suede inserts to hold occupants during maneuvering. Rear seats have matching performance suede inserts. All seats have contrasting red stitching. Other sporting touches include "carbon fiber" technical leather trim on the steering wheel for better grip, and special finishing on the center stack. A 180-mph (300 kph) speedometer, tachometer and temperature gauge feature dark faces unique to the all-new 2006 Dodge Charger SRT8. An LED display within the gauge cluster is driver-configurable for oil temperature, oil pressure and tire pressure readouts. 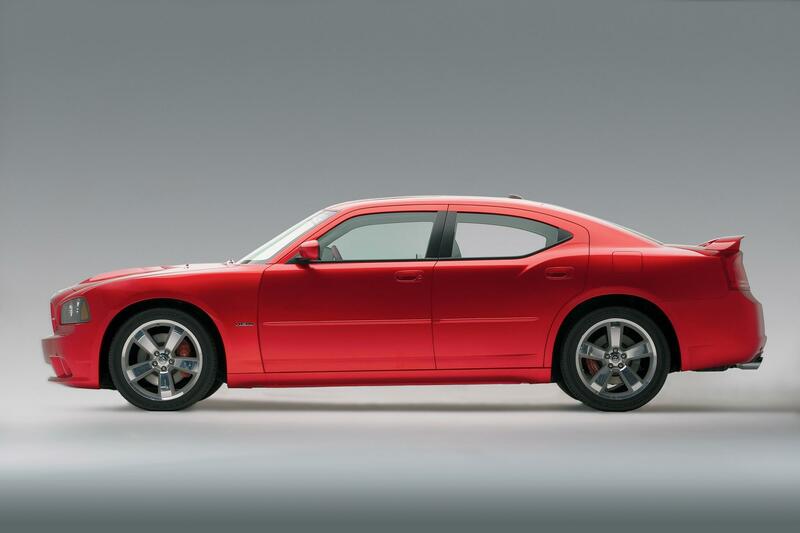 Available options on the 2006 Dodge Charger SRT8 include power sunroof, Kicker audio system with six-disc CD changer, DVD-based Navigation system with turn-by directions and voice prompts, automatic temperature control, heated front seats and side air bags. Also available are SIRIUS Satellite Radio and a UConnect hands-free communications system with Bluetooth technology. This system recognizes up to seven different Bluetooth-equipped cellular phones and responds to voice commands, utilizing a microphone in the rear-view mirror and the stereo system�s speakers for hands-free conversations. The 2006 Dodge Charger SRT8 interior is offered in Dark Slate Grey/Light Graystone. 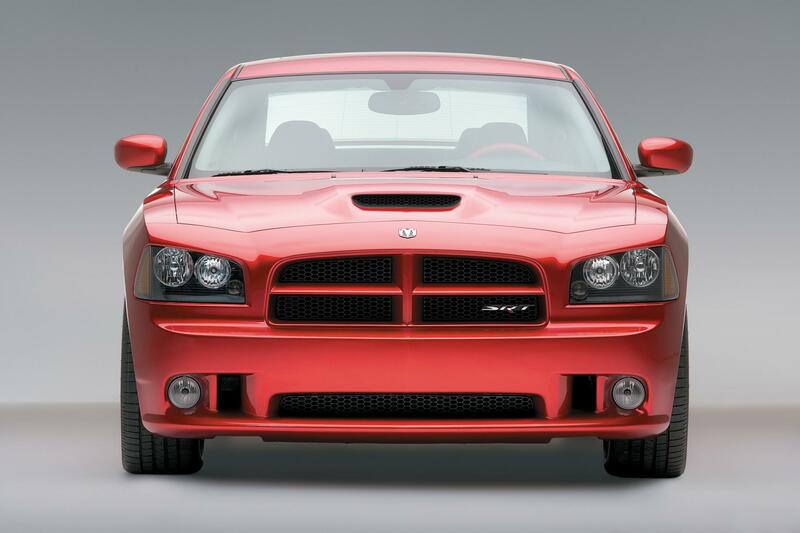 Just as the very first Charger � the original 1964 "Charger by Dodge" concept car - sported a HEMI V-8, the all-new 2006 Dodge Charger SRT8 gets its motivation from a HEMI, too. In this case, it�s a big-bore, SRT-engineered version producing 425 horsepower and 420 lb.-ft. of torque. Several features of the new 6.1-liter SRT HEMI recall the legendary HEMI engines of previous decades, including the namesake hemispherical combustion chambers that provide power and efficiency, orange-painted cylinder block, black valve covers, and even the horsepower rating (with less displacement, the 6.1-liter HEMI�s 69.8 horsepower-per-liter rating exceeds that of the legendary Street HEMI of the 1960s and �70s). 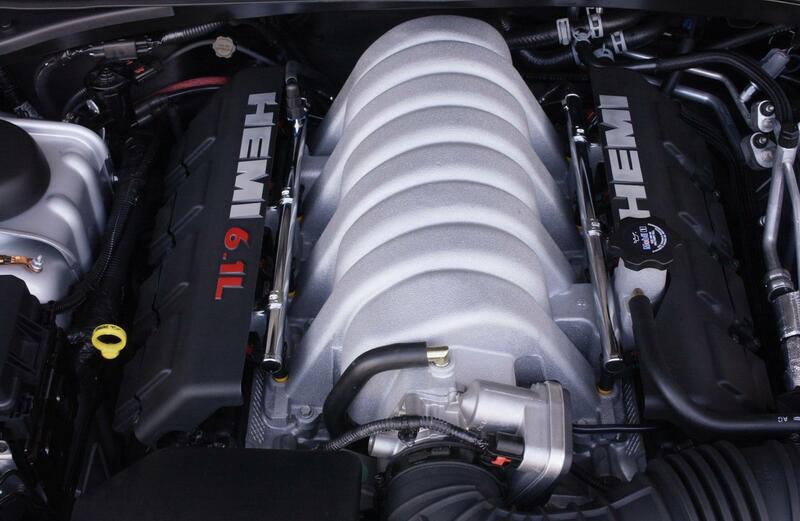 To create the 6.1-liter version of the Chrysler Group�s HEMI, SRT powertrain engineers applied tried-and-true engine-building tricks honed by generations of American hot-rodders. They unleashed 85 more horsepower by adding more cubic inches, increasing the compression ratio, redesigning the cylinder head, intake and exhaust systems for increased flow, and increasing engine speed. For more displacement, SRT engineers bored out the diameter of the cylinders in the HEMI by 3.5 millimeters each in order to increase the total displacement to 6.1 liters from 5.7 liters. Compression ratio was also increased to 10.3:1 from 9.6:1, increasing engine efficiency and power. Engine breathing was increased with new higher-flow cylinder heads, a specially designed intake manifold, and exhaust headers with individual tubes encased in a stainless steel shell, all unique to the 6.1-liter HEMI engine. Larger-diameter valves and reshaped ports in the heads allow for maximized air flow. The intake manifold was designed with larger-diameter and shorter runners for higher-speed tuning. Exhaust is routed through a large-diameter (2.75-inch vs. 2.5-inch) exhaust system with 3.5-inch chrome tips. To further increase horsepower, performance-oriented camshaft profiles were developed to allow more air in and out of the cylinders, as well as manage a higher engine speed. SRT engineers increased HEMI�s peak power output engine speed nearly 20 percent to 6,000 revolutions per minute (rpm) from 5,000 rpm. Intake and exhaust valve stems are hollow, and exhaust valve stems are filled with sodium to help dissipate heat more efficiently. The high-performance SRT 6.1-liter HEMI is strengthened with redesigned components, including a reinforced engine block, forged steel crankshaft, high-strength powdered-metal connecting rods, floating-pin pistons (cooled by oil squirters), and an oil pan modified to manage oil return to the pan sump at high engine speeds. Power for the SRT 6.1-liter HEMI is channeled through an A580 five-speed automatic transmission with specially calibrated driver-selectable AutoStick, which offers fully automatic or manual shifting selection. A heavy-duty four-flange prop shaft sends the torque from the transmission to an upgraded differential and axles. Electronic Stability Program (ESP): This feature aids the driver in maintaining vehicle directional stability, providing oversteer and understeer control to maintain vehicle behavior on various road surface. The 2006 Dodge Charger SRT8 will be assembled at Brampton Assembly Plant in Brampton, Ontario, Canada. With a U.S. market share of approximately seven percent, Dodge is Chrysler Group�s best-selling brand and the fifth-largest nameplate in the U.S. automotive market. 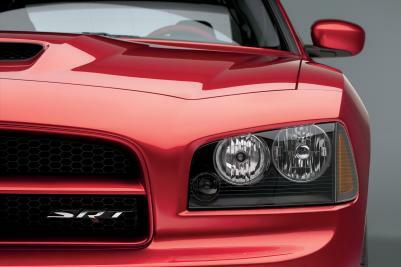 In 2004, Dodge sold more than 1.4 million vehicles. Dodge continues to lead the minivan market segment with a 20 percent U.S. market share and maintains an 18 percent share of the highly competitive truck market. In 2006, Dodge also will enter key European volume segments.